This article will explore some of the attitudes to and initiatives within the world of recycling, in various European cities and one American city. Policies toward recycling clearly differs from country to country, depending on both the attitude of the Government in place at the time, as well as local Council politics, and importantly, consumer pressure affecting National and regional policy. Within the Californian City of Santa Monica, all the communities waste is put into one waste bin. This is then hand-sorted by workers at the recycling centre in the cities Industrial zone, which is run by a private company, paid for by tax dollars. This single-streaming process seems laborious, being labour intensive, but has the advantage of focusing the operation in a single venue, and gives residents no responsibility to sort out their rubbish from their recyclables. Within the centre, plastic waste is packed into bales. 4 out of 5 bales are sent by train to companies within the US that transform them into textiles and carpeting. The fifth bale is shipped to China for processing there. Glass is sorted and sold to re-processors and manufacturers locally, and aluminum cans are sold to the Anheuser-Busch brewery in Missouri for re-processing. White for glass, and yellow for paper, metal and plastic. All other trash is put into a green bin. Council officials claim that 2 recycling options is the limit they believe Parisians will tolerate. This is borne out with a conservative estimate in the city that in every recycling bin collected, 7 items will be correct, and 3 are unrecycleable and should have been put in the trash. At a recycling centre on the outskirts of the city, workers hand separate items before technology takes over: steel is removed with a magnet, and plastic and cans are kept together, while paper and card are shipped by barge to a plant in Rouen for pulping. 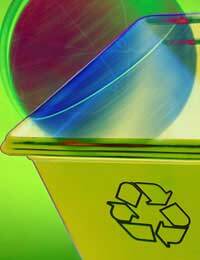 Proudly officials claim that all the separate recycling processes are done within France. France has pioneered some recycling technologies so that until recently, the UK shipped some of its recyclable waste to be processed in France. Germany is a true pioneer in the field of recycling: one poll suggests that 9 out of 10 householders willingly separate their trash. This is demonstrated clearly in the capital, Berlin, where 7 different bins exist for all the various recyclable waste – general waste, paper, compost, plastic/metal, amber glass, clear glass, and green glass. A private company is responsible for dealing with all this, and it uses state of the art recycling plants to do so. Waste is separated by scanners, and packed into appropriate bales by machinery. As with France, Germany claims to deal with all its waste within its own borders. It has long had an enviable reputation as a country committed to dealing with its waste sustainably. The residents of Madrid have 3 bins for their waste. A separate glass-treatment facility is used outside the city. Here, it is subject to scrutiny by conveyor belts, human hand, magnets and sieves before being melted down and processed into bottles again, or other household objects with a longer-term value. Spain leads the market in its glass recycling technology. These few examples of city initiatives in recycling give a glimpse of what is happening in this field, both in Europe and further afield. Each country, at least within Europe, is adhering to EU and worldwide agreements on waste, recycling and sustainable development, and striving to develop technologies to recycling most consumer waste. How this translates down to city-level and the emphasis each city gives to this growing problem, is a fascinating study – Santa Monica with 1 recycling bin, and Berlin with 7, for example. It is clear however that where one country specializes in one kind of recycling technology, this knowledge should be shared with others, rather than one country exporting waste to another, such as from the US to China. This has an environmental impact. Ultimately, this issue is one that is driven by consumers – if the will to recycle is there, each and every community will find a way to do it. Be part of your recycling community in whichever city or village you live!